NEW YORK – Amid disclosures of IRS harassment of conservatives, the maker of the controversial film “Dreams from My Real Father” now suspects he was the victim of tag-team harassment by the IRS and a leftist journalist apparently working in concert to intimidate him and his investors. WND previously reported director Joel Gilbert was concerned a journalist investigating his documentary used information that could only have been obtained by hacking into his company’s bank account. Gilbert now believes the confidential information supplied to the journalist could have come from a continuing IRS audit initiated in early 2012, possibly in retaliation for Gilbert’s documentary arguing Frank Marshall Davis is the president’s biological father, not the Kenyan Barack Obama. Gilbert says the IRS in Los Angeles may have provided confidential information on his corporate financing to Seth Rosenfeld, a San Francisco-based reporter affiliated with the Soros-funded Center for Investigative Reporting. Rosenfeld, in turn, used the guise of writing a story as an excuse to telephone and confront Gilbert’s financial backers with details of their financial transactions recorded in Gilbert’s corporate bank accounts. In an email to WND, Rosenfeld denied the IRS was the source of his information identifying Gilbert’s customers and investors and providing specification of their financial transactions as recorded in Gilbert’s corporate bank account. In responding to questions posed by WND, Rosenfeld declined to disclose how he came to possess the detailed financial information he exhibited when telephoning Gilbert and various Gilbert customers and investors claiming he was researching a story. Gilbert told WND he is meeting with legal counsel Monday to determine if he has a cause of civil or criminal legal action against the IRS and/or Rosenfeld. In early 2012, the IRS reopened Gilbert’s 2009 tax return and denied all of his business expenses, even though they were well documented. To resolve the issue, Gilbert’s accountant met the IRS auditor in Los Angeles. “To our shock, the IRS agent who met with my accountant had a printout of the home page of the “Dreams from My Real Father” official film website on her desk,” Gilbert told WND. Despite Gilbert resubmitting the 2009 expenses, the IRS has still not closed the case, with the next meeting between Gilbert’s account and the IRS set for next week. The IRS spokesman in Los Angeles did not respond to a WND request for comment. Gilbert began to suspect the IRS had distributed his information to left-leaning journalists when Rosenfeld telephoned him Oct. 26, 2012, near the end of the presidential campaign, and began citing specific deposits from Gilbert’s corporate bank account, asking Gilbert to explain the purpose of the deposits. Rosenfeld is listed on the Center for Investigative Reporting website as a “correspondent,” suggesting he does not have a staff position with the organization. The Center for Investigative Reporting did not respond to a WND request for comment. Next, Gilbert told WND, Rosenfeld called one of Gilbert’s corporation’s limited partners on his private telephone number, fraudulently introduced himself as being with the Romney campaign and asked for a campaign donation. Next, Rosenfeld called the elderly mother of a Gilbert customer who had purchased a large number of “Dreams from My Real Father” DVDs and paid for them by check. Gilbert told WND he has documented that Rosenfeld contacted several of his customers on their private unlisted phone numbers, citing for them various payments or wire transfers to Gilbert’s corporate account. Rosenfeld asked the customers for their political opinions and whether or not the customers had made any campaign contributions to Republicans, including to presidential candidate Mitt Romney. Gilbert told WND he now believes an IRS leak was the likely source of Rosenfeld’s information. He also believes Rosenfeld’s phone calls, armed with specific records regarding customer transactions in Gilbert’s corporate banking account, has damaged his business. “It is true that as a freelance journalist I was researching a story about people who anonymously funded the distribution of the Joel Gilbert film that attacks President Obama, claims his election is a part of a vast communist conspiracy and displays pornographic photos of his mother,” Rosenfeld emailed WND in response to a request for comment. Rosenfeld denied that he misrepresented himself or engaged in any improper or illegal conduct. Rosenfeld said he again sought comment from Gilbert by phone and email and never got a response. Rosenfeld denied that he received any information concerning Gilbert’s corporate accounts from the IRS. He also denied representing himself as being associated with the Romney campaign, and he denied asking any of Gilbert’s contacts for contributions to the Romney campaign. 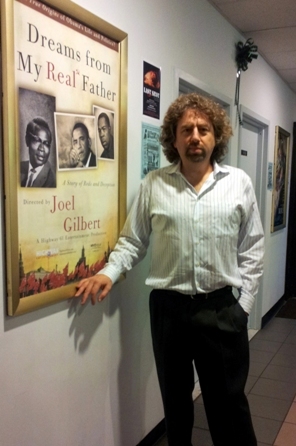 Gilbert rejoined Rosenfeld’s charges, arguing that Rosenfeld’s negative characterization of “Dreams from My Real Father” raised the question of whether Rosenfeld had actually viewed the DVD. “The response further reinforces my concern that Rosenfeld was recruited to do the dirty work, to intimidate me from continuing to market the firm, for political purposes on behalf of higher powers,” Gilbert said. Gilbert told WND that he and the customers and investors Rosenfeld contacted have documented all phone calls and conversations for presentation in any legal proceedings that may occur. “Rosenfeld and those who provided him with my private bank information should come clean now, because the story will only get bigger if they do not,” Gilbert threatened. Gilbert believes the IRS and Rosenfeld targeted him for political reasons. “Why didn’t Rosenfeld publish anything from his investigations into my film and my investors?” Gilbert asked. He also believes the IRS and Rosenfeld may have been working together to intimidate investors and discredit his film by identifying him as a Republican Party operative. “The fact that the IRS targeted me and Rosenfeld subsequently made his phone calls suggests to me they were working in concert, both equally afraid of the information in my film becoming public knowledge,” Gilbert charged. Gilbert believes Rosenfeld was not being sincere in his representation that he was writing an article but that his true intent was intimidation. Gilbert’s documentary “Dreams from My Real Father” has been available at the WND Superstore since it was produced and also on Amazon.com and Netflix. During the presidential campaign, WND reported Gilbert mailed more than 3 million free copies of the documentary to voters in swing states. Fox News reported in May 2012 that the Center for Investigative Journalism has received close to $1 million from the George Soros-funded Open Society Foundation. Rosenfeld is the author of the 2012 book “Subversives: The FBI’s War on Student Radicals, and Reagan’s Rise to Power.” In the book, he objects to what he characterizes as Ronald Reagan’s involvement for political purposes in a covert war the FBI waged in the 1960s against anti-war student radicals. Is there ANYONE, that at one time or another, that hasn’t been threatened, coerced or robbed by these lawless criminals? The only ones that come to my mind is the generational Entitlement crowd. Ooops..forgot..Illegal Aliens. I was audited once a few years ago. It was simply a fishing expedition on their part.